A starship hurtles through the empty void of space towards an unknown destination, it's purpose and history lost in the midst of time. 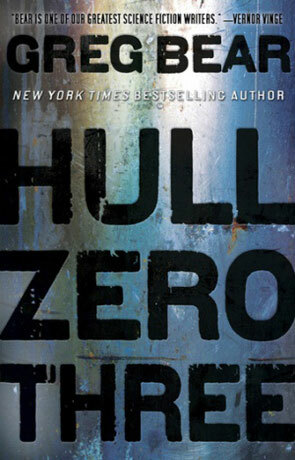 One man finds himself ripped from his dream of a new home and partner and awakens to the freezing cold and dark halls of Hull Zero One, a place that seems full of dangers. He has no memories of who he was, where he worked or what he is doing on board the ship, if he wants answers he's going to have to survive long enough to find out what's happened to Hull Zero Three. I love how Greg Bear still writes about big ideas, he has an incredible talent that allows us to glimpse the truly alien and far future societies and yet manages to write for the layperson without overly technical descriptions and little explanation. This style of exploration allows the reader to feel closer to to the characters, to only know what they find out during the adventure and experience the highs a lows as they do. One of the things that's so interesting about Hull Zero Three is the way the author manages to combine these grand ideas with a tightly paced plot and a fantastically disorientated theme as the protagonist uncovers little pieces about the ship and it's unusual crew. While this idea of a generational ship - or more accurately a colony ship gone astray - is nothing new the way it's presented here is different enough to give it a unique edge. At it's heart though this is a story not about space but about about humanity, how we fit in the vastness of the universe and how we understand ourselves both individually and as part of a race. This message is carried through by the characters themselves and it's these very well written people who are the real focus of the story. The book is split into three parts "The Flesh", "The Devil", and "The World" which mainly describe each of the three parts of the twelve kilometre long ship. I really don't want to give too much away here as part of the magic is discovering the story for yourself, it is an incredibly rich and rewarding tale and one that is right up there with the authors finest works, and in fact amongst the finest scifi of recent times. In parts I was reminded a little of Stephen Kings Dark Tower series but with a system shock edge - not easy to define and pretty unique. The whole book is also concluded magnificently, a great ending that wraps the book up perfectly. Hull Zero Three is a modern classic science fiction adventure that you really shouldn't miss. Written on 28th November 2011 by Ant.